I have been teaching professionally for over 30 years. I have taught guitar to students of all ages and experience levels in both private and classroom settings. I’ve produced many instructional videos including a 16 part guitar lesson series for Beginners Guitar and Rock and Blues Guitar. I have also produced hundreds of videos for my website along with other instructional material. I also offer jam tracks to help students advance and learn improvisation and soloing techniques. My teaching studio offers a comfortable learning environment. If you choose lessons via webcam, you can learn in the privacy of your own home. On My website you will find materials to supplement my private lessons. The website is currently available to all visitors. There are video lessons, jam tracks, written materials for scales, chords, exercises and much more available to print and use online. I am a graduate of the Hartt School of Music with a Bachelor of Music degree. I have played in many local bands based in Connecticut and New York City and I continue to perform and teach guitar. 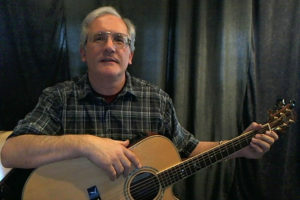 I have been a member of the Connecticut Songwriters Association and I am a member of BMI with original music placed with a number of publishers. Like a lot of people who have been playing on and off for many years, I was feeling stuck in old patterns, old techniques and old ideas. Working with Bob has opened me up to new approaches and new ways of thinking about playing, and I’m really pleased with the results. I’m playing better and enjoying it thoroughly. Bob has worked with me to determine what my goals are and how best to reach them, tailoring his lessons to suit my interests and to help me get the most out of my time. He is a patient, encouraging and generous teacher. You have opened up music to me! You have made creating and starting to understand music accessible! Thankyou!!! After playing guitar for more than 20 years, I recently realized how much I did not know about playing guitar! Mostly, I felt that my improvisation was unimaginative and stuck in a rut… If I had not found a good teacher (and I had been looking for a while) I definitely would not have become excited about playing again… you showed me some concepts and music theory that really made a lot of sense… I have been making progress ever since… you are open to the type of music that I want to learn and play… you take the time to work it into our lesson and connect it with the music theory. You “teach me to fish” and that is really appreciated… I have so much more that I want to learn and now that I have the right teacher, I know I’ll get there. Thanks a million!